Although my experience traveling to in Vietnam is relatively small in comparison to older, more wealthier and more able travelers, I would consider some of my experiences to hold up against others. I also have a damn good source for a consult (my wife, having lived in Ho Chi Minh City for the first 17 years of her life). While on my travels there though (and my current stay, as it’s like you are reading this while I’m on the plane to, or currently in Vietnam), I’ve noticed quite a few patterns and trends that make the city differ from the places I’m used to in America. So I decided to do a little extra research on the side, and as my wife for a consult on certain facts here and there, and have come up with this list of 7 things Americans should expect when traveling to Ho Chi Minh City. This isn’t an exhaustive list, as I have plenty more to say about the differences in lifestyles and culture. However, looking only from a tourist’s perspective, and what a tourist would experience, I’ve come to believe that these 7 things are the essential pieces of knowledge and understanding in order to sedate complete culture-shock when visiting the city for the first time. They are in no particular order of importance. 1. The heat can be intense, and it rains a lot. These aren’t just for fashion. They actually work to cool you off. It goes without much explanation that this city is going to present visitors with high temperatures and a tropical climate, as it rests slightly above the equator. The very first thing you’re going to notice while visiting really any place in south Vietnam, is the heat. This is especially true if visiting between near the summer time. It gets cooler at night, sometimes, but I’m talking 80 degrees and humid kind of cool, not 50 like you’re used to. Of course, in the ‘winter’ time (for America) the temperatures may be around 10 degrees cooler compared to summer, but that’s about all the flex you’ll get with the heat. Prepare for hot nights and much hotter days than you’re likely used to, and plan to drink plenty of water. 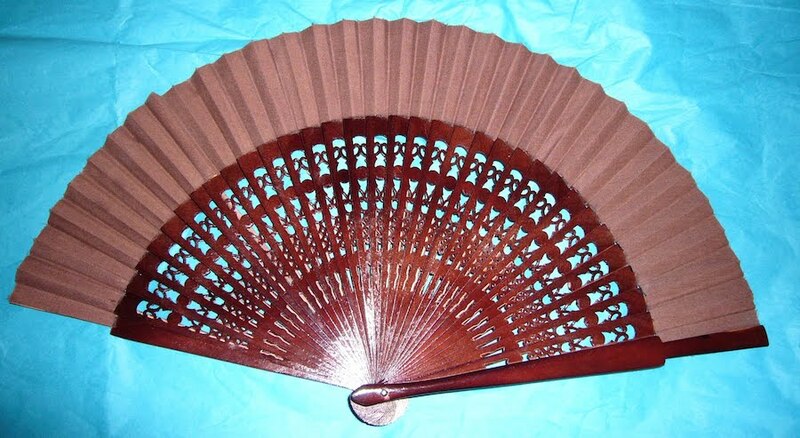 Many Vietnamese people try to stay inside when the sun is highest in the sky, just because they can have air conditioning in their bedrooms, or at minimum a fan. The middle of the day is an excellent time for a nap if you can afford it with your schedule. You’ll also notice, especially if traveling in the summer time, that it rains almost every day, sometimes without much warning beforehand. 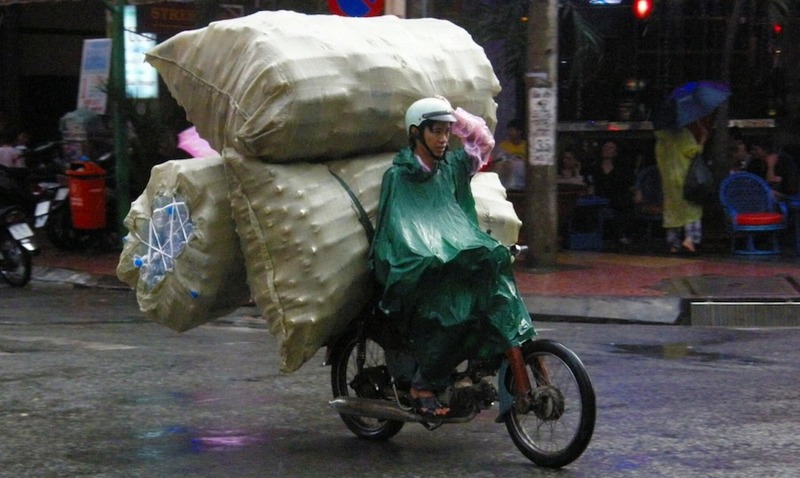 The Vietnamese people are used to this, and adapt incredibly well (it seems like they always have a poncho ready to go). Even if the weather is bright and sunny, if you’re going to be out and about for a while, bring something preparing you for rain. You’ll thank me later. 2. The traffic is insanity. Ho Chi Minh City has a population of around 6.7 million people at the time of this being published, and the people within that large population love to move, and they will be moving around a lot. The streets are narrow compared to the United States, and as such, there isn’t a feasible way for people to travel without getting away from the large 4-wheeled automobiles. Plus, cars are expensive. As such, plan on seeing an insane amount of scooters and small-volume motorbikes. More than you’ve ever seen, unless you’ve visited other Asian countries before. If you’ve ever been to a biker-rally here in the United States, you’ve probably assumed you’ve seen what it’s like to be around a ton of bikes before… and as long as you’re in America, you’d be right. But, that amount of bikes in a small area is completely standard driving conditions in Ho Chi Minh City, and as such, an entirely different traffic system and culture has developed there. I don’t care who you are, you have to acknowledge that talent. They can also fit some pretty insane stuff on their scooters as well. It’s the primary form of transportation for more than just people. You’ll find that sometimes, entire families can fit on a scooter. I’ve seen women carrying infant children in their arms while riding on the back of them sometimes. If you want to know more about traffic there, I highly recommend checking out my more dedicated discussion on the topic here. 3. Air quality is much worse than you’re used to. The United States is a very large country, and we have lots of open space and vegetation (trees). On top of that, we also have large vehicles as our primary form of transportation. You may think that having larger vehicles is worse for the environment than smaller bikes and such, and you’d be right. But how many bikes does it take to equal the same level of air pollution that an SUV produces? What about if that bike is much older than your SUV, and built with engines that aren’t running nearly as clean as your large vehicle? In reality, while scooters are a more fuel-efficient mode of transportation, the sheer volume of them running around makes for a much more serious pollution problem. 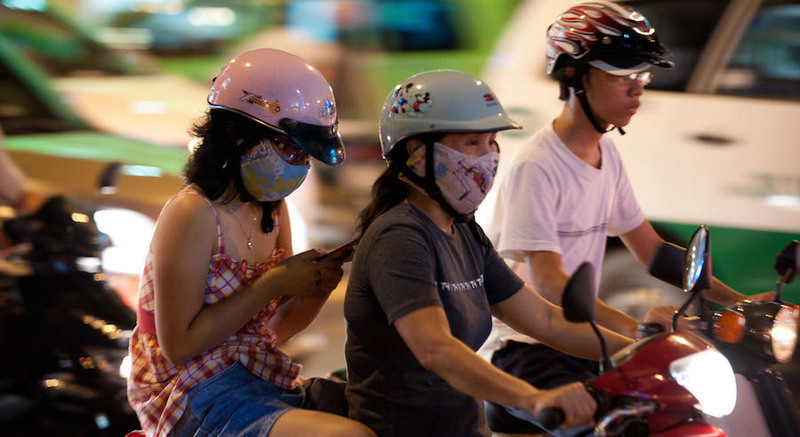 You may not notice it much if you’re on a large sidewalk or something, but if you are driving around in a scooter, or having somebody drive you around in a Xích lô, you’ll certainly feel the difference when you try to breathe. It won’t take you long to understand why most of the people driving around on scooters are also wearing masks on their faces. Having had the experience of riding with and without a mask… take my advice: wear the mask, unless you like coughing. Most of the county has beautiful landscape, amazing mountains and glorious beaches… but in the major city of Ho Chi Minh, the air isn’t pretty. 4. You can get good deals if you know the language. Be one with your inner dealmaker. if you want it, it will come. Unless you’re at a garage sale, American commerce isn’t really a place for negotiation most times. All prices for items are clearly displayed, and you don’t really have to ask “how much” very often. In many of the “brand stores” in Saigon (District 1), and around the city, this is usually the same as you are used to. Places such as Diamond Plaza where prices are fixed, and if you want the item, you pay the price they list it for. But there are many places around town that also give you lots of flexibility. Places to shop for fairly high-quality handmade items where there are no prices listed. In these locations, it’s important to know one VERY IMPORTANT thing as a tourist: sellers ALWAYS try to charge you double what they actually want for the items. Learning how to heckle and bargain for the products you want is essential to a successful shopping experience in these areas. The merchants see you as a source of wealth, as an American, and want to exploit that as much as possible. You will look at something, and think it’s a great deal compared to back home in the United States. – That’s what they want you to think. That’s how they make their money. This is especially true if you don’t know the language, or don’t travel with someone who grew up in the city. If you have the opportunity to travel with somebody you trust that knows the people of the city, do it. Otherwise, just prepare to pay more than what everyone else in the country pays. Never, under any circumstance, except the first price they give you. Take that first price, and know that you can get 50% off or more if you are persistent enough to their “oh come on man, don’t try and cheat me” kind of attitude. It’s usually an act. Prime example here: I purchased a figurine made out of steel for my brother. It looks like “predator” (from the movie) and it has a bow. The figurine is made entirely out of steel nuts, bolts, and other assortments of parts. The initial price for this item was $25. With a lot of persistence, and having Hang with me to help talk to him as well, I walked away with it for $12. One trick I found especially helpful, is to know when you’re at the lowest they’ll go. Have a goal, and be able to spot when you can reach it. When I get very close to the price I wanted, but not quite there, I simply walked away, slowly. I’d talk to Hang (or a friend, if you have one with you) while walking away… if they want the sale, and they are willing to go any lower, they’ll come after you. “Wait, okay for you, I do it!” Won’t work everytime, but if you’re close to getting what you want, the threat of losing the sale is usually enough to tip the odds to your side. See the next page for more. That was very interesting. I learn a lot from your posts. :) I hope you all have a great time. Great advice. I trust you schooled the rest of the family.